The Greek Mythology is filled with great stories about gods and titans, this is why there are many games that are themed around them. One of these games is this one, Titan Storm, which is based around the epic battle between the Titans and the gods of mount Olympus. This is why all of the visuals and the symbols of the game are inspired by gods and titans. 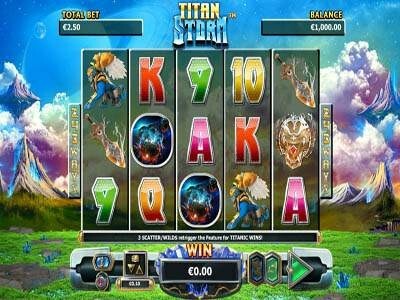 Titan Storm is a Next Gen Gaming powered slot game that has 5 reels and boasts a total of 243 ways to win for players to place bets on. They can do that underneath the reels by going through the game’s betting options. The game has a wild icon, which is none other than the king of the gods, Zeus. He will use his godly power to help players in getting paid by substituting for other icons on the game’s lines and reels. This is only one of the many special icons and features that the slot game has.